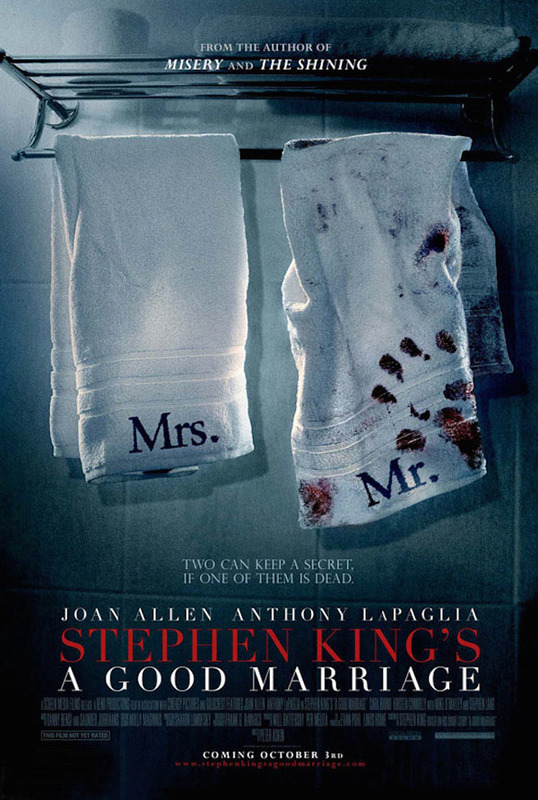 Based on a short Stephen King story (who also wrote the screenplay) - and which I haven't read - A Good Marriage, never really reaches any great heights because the mystery and thrill is taken out of the equation early on and the rest of the film is a waiting game with no papable tension. A Good Marriage is about Darcy (Joan Allen) and Bob (Anthony Lapaglia) a very happily married couple but Bob hides a horrible secret. When Darcy finds out, she wrestles with what she should do. Unfortunately its not nearly as sensible or ridiculous to make the film really pop. This part of the problem with A Good Marriage in general whilst characters in the film want to maintain their vanilla exterior, so to does the film. The film spends a good twenty minutes hammering home how nice this marriage is, how ideal this family is, with all this ground work it doesn't strip this away enough. Yes, Bob's secret is horrific but it is played to low key for my liking. As I mentioned before from the outset of the film there is no guessing needed to know what the secret will be and I think that is alright because it's not a 'whodunit' but rather a thriller with a 'what would you do' slant to it. Both Joan Allen and Anthony Lapaglia work well together, Allen having the harder job of conveying her stituation whilst LaPaglia's measured, matter-of-fact delivery gives his character the friendly yet empty feeling you would imagine. We only really get to scratch the surface of these characters though and it becomes a leap of faith to go along with happens because you have nothing else to base how you react to their decisions. Whilst the actions are in some cases extreme, this essentially means nothing if it hasn't been established that extreme actions are out of character. Peter Askin directs the film in a straight forward manner, with no real notable flourishes, that is not a dig at the director, it's just how the film was. The directing was like the film - measured without taking any risks. Having largely been down on this film, it is certainly not all bad. LaPaglia brings a mordant and dark humour with his lines, walking the tightrope too much either way would've ruined his character. For me though, A Good Marriage never went where it could've gone or where I wanted it to go, any atmosphere that was built up quickly disapates and only when the final act is nearing its climax does it pick it up again, even then it doesn't last long. If A Good Marriage was willing to get it's hands dirty it could have really been something.